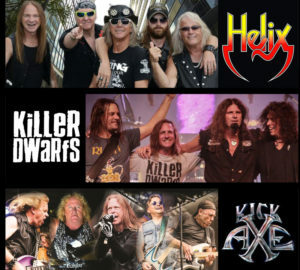 HELIX, has sold over 2,000,000 albums, had four gold and 2 platinum albums, toured 19 countries, 3 continents, and played with over 150 of the greatest rock and roll recording acts in the world. Their list of hits include; Heavy Metal Love, Rock You, Gimme Gimme Good Lovin’, (Make Me Do) Anything You Want, Running Wild In The 21st Century & Dream On. THE KILLER DWARFS quickly gained international success in Canada with the Juno nominated self-titled 1983 KiLLeR DWaRFs debut album. They soon cut the iconic album STAND TALL in ’86 including the first single, “Keep the Spirit Alive,” Others hits, including; ‘Doesn’t Matter’, “Hard Luck Town” “Cowboys and Conmen “ & the chart topping “Driftin Back”. KICK AXE is one of the best heavy rock groups to come out of Canada in the eighties! The group received a gold record for their debut album “Vices” and toured with several rock heavyweights such as Judas Priest, Scorpions, Metallica, Rush, Quiet Riot, and WhiteSnake. Their hits include; On The Road To Rock, Heavy Metal Shuffle & A Little Help From My Friends.